It’s always nice when a team leaves a meeting feeling inspired and excited. It’s even better when the meeting has been productive. When a great team works together under ideal conditions, amazing things happen. The problem with team meetings—even with outstanding teams—is that conditions are often less than ideal. Collaboration can be challenging. The struggle to stay organized can slow things down, keeping your team from striking that perfect workflow. Your boss has called an emergency meeting to put together a last-minute pitch deck for a high-profile client. The team’s success is vital to your operation and failure is not an option. Your team’s coordinator asks you to take notes and help keep everyone on track, all while contributing your own thoughts to the project. You’re instantly on edge because you know what’s coming. You arrive early to ensure the right cables are in place to connect your laptop and smartphone to the room display and document everything. Once the meeting starts, you find yourself in a frenzy: typing notes, snapping photos of the whiteboard, reading back individuals’ thoughts, and trying to keep things organized so they make sense. The rest of the team is struggling to make sense of everything too. Papers are flying, ideas are getting lost in the shuffle, and everyone’s losing momentum as the project grows. The company’s wireless network is strained on a normal day, so progress is slowed down even further as people try to find the right cords to share the presentations they’ve prepared. Sure, your team is the best, so you’ll get it sorted out eventually. But how long will it take? Even when the meeting’s over, you’ll have tons of work to do compiling and emailing the information to everyone. You sigh, bracing yourself for a long evening. What this meeting needs is a digital transformation. What if you had an easy to use solution that could keep everyone organized and on track? One that could keep track of all the ideas, notes, images, and documents that go along with the collaborative process? One that could save all of that information and allow on-the-spot collaboration? Windows Ink and interactive touch can make it happen. ScreenBeam Wireless Display lets you use them efficiently and easily, making your team meetings more collaborative and more effective. Let’s try again. Your team’s coordinator has asked you to take notes and help keep everyone on track. In this scenario, you’re not concerned. You know that your team can get this done effectively and efficiently with just three easy steps. Connect wirelessly to the front of room display and share your content right out of a Windows Ink supported app like OneNote. Because ScreenBeam eliminates cables, meetings start quickly and allows for complete mobility and a far more interactive experience than ever before. You can now switch presenters without delay anytime. The presenter would simply swipe to disconnect, allowing another team member to take control of the display with one simple click. Since your ScreenBeam Wireless Display is equipped with Miracast, there’s no need to use the company’s wireless network. Windows ink makes it simple to get your team members working together. Marking up content and images or creating sticky notes allows a presenter or participant to get their point across efficiently. ScreenBeam wireless display + Windows 10 allows all those annotations to be instantly captured and saved on the presenter’s screen, even when the device is not natively touch-enabled. Imagine never again having to stay after the meeting to unscramble and capture everyone’s comments. At the end of the meeting, simply close your laptop. OneNote instantly saves and shares all notes to your team members, so there’s no need to send a follow-up email with attachments. Everyone is already equipped with a copy. 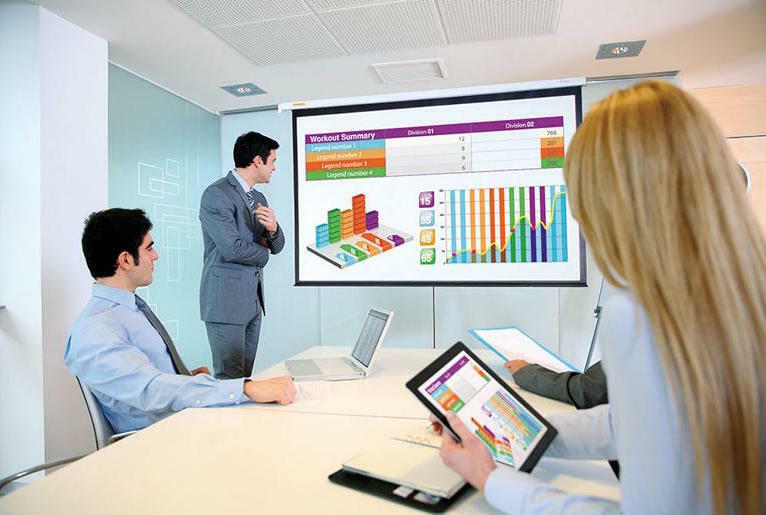 ScreenBeam Wireless Display takes care of the connectivity and enables the power of interactive touch for real-time sharing and collaboration. The meeting is nothing less than efficient. Team members make their annotations directly on the main display, and touchback sends all the data back to the original device. Saving and sharing are simple with OneNote. Everyone is connected and on-track because their Windows 10 devices are equipped with the latest Miracast and their favorite Microsoft applications support digital inking. Team members are free to move about the room, and there’s no slowdown for finding and connecting cords. Everything is wireless thanks to ScreenBeam. The above scenarios both play out every day in companies around the world. The trick to making your meeting more like the second one is simple: Use the right technology. Windows Ink is an outstanding tool that’s easy to implement. Its key features and optimized usability can make any meeting more efficient and more productive. ScreenBeam unleashes the power of Windows Ink native in all those Microsoft programs and apps you love and use in the workplace. A parting thought: Don’t be overwhelmed with all the devices, software, and collaboration techniques that Windows Ink allows. This incredible tool brings loads of possibility to your meetings, and its uses are extraordinarily customizable. A Windows Ink stylus is nice to have, but Windows Ink can be used on any Windows 10 device, even non-touch devices. Having the essentials—the best wireless display device and Windows Ink—will transform your meetings. Digging into Windows Ink’s full capability with all the bells and whistles can take you to the next level. Your team and your company’s needs are unique, and Windows Ink allows a lot of flexibility. The technology is there. How you use it is up to you.